As the longest-reigning Victoria’s Secret Angel, longtime face of Maybelline New York and runway legend Adriana Lima has officially achieved icon status. The Daily caught up with the Brazilian bombshell to reflect on her storied career. When did your career really start? When I first arrived in New York at 16 years old, I met Ellen von Unwerth and we did my first photo shoot for a Japanese magazine. She gave me plenty of work in editorials and campaigns at the beginning. After that exposure, I started working with Steven Meisel. We shot Italian Vogue, and that brought me to high fashion. Signing my first contract with Victoria’s Secret in 1999 was another major moment. It made you a household name. Thanks to them, I was known around the world. What does the word “icon” mean to you? I’ve never seen myself as a fashion icon. To receive the award is an honor for me. I am inspired by movies and different actresses — Rita Hayworth, Sophia Loren, Lauren Bacall, Ava Gardner, and Michelle Pfeiffer. Which photos are you most proud of? I have a few in my house that we took for Victoria’s Secret, which we shot in Mexico. The pictures make me feel like I’m back home in Bahia [Brazil]. I feel really connected to them. One of my favorite moments was shooting the campaign for the fragrance Decadence by Marc Jacobs. It felt like there was something iconic and timeless [in the image]. You’ve spent a lot of days on set. What are some of the craziest things you’ve been asked to do? I had to be on roller skates once, and I couldn’t do it — I couldn’t stand up! It was funny and awkward at the same time. In a different editorial, they put me in a blonde wig. I didn’t think it was going to work because of my skin tone. They were nice pictures in the end, but I don’t like myself with blonde hair. I always say to myself to be myself at all times. When I go to a photo shoot — or anywhere — I bring the Adriana Lima from Bahia. I don’t create [the persona] of something I’m not. I am who I am, and that’s who I bring into my work. You got very emotional walking in your final Victoria’s Secret show last year. Did you expect that? Yes! I knew for a year [beforehand] that it would be my last walk, and I was emotional all year about it, because I hold the brand in my heart. I truly loved the work we’ve done together. I was trying my best not to cry, but I just broke down in tears. I loved walking the runway. It was always the highlight of my life. Knowing that it was my last time wasn’t easy to take in. It was very emotional. During the rehearsal, they had a surprise for me that I didn’t know about. I didn’t know they were going to do a video and segment dedicated to me. When I saw that, I broke down in tears. I had no clue. I felt very appreciated and loved by everyone. It was a wonderful feeling. I broke down in tears because I was sad, but also because of the love expressed. It’s not just the brand but the girls, my dressers, the makeup artists. Did a lot of the models come up to you and tell you what you meant to them? Yes. They gave me a lot of hugs and said it wasn’t going to be the same without me and they’d miss me. You’ve been with Maybelline New York for a long time. What were your early days like? 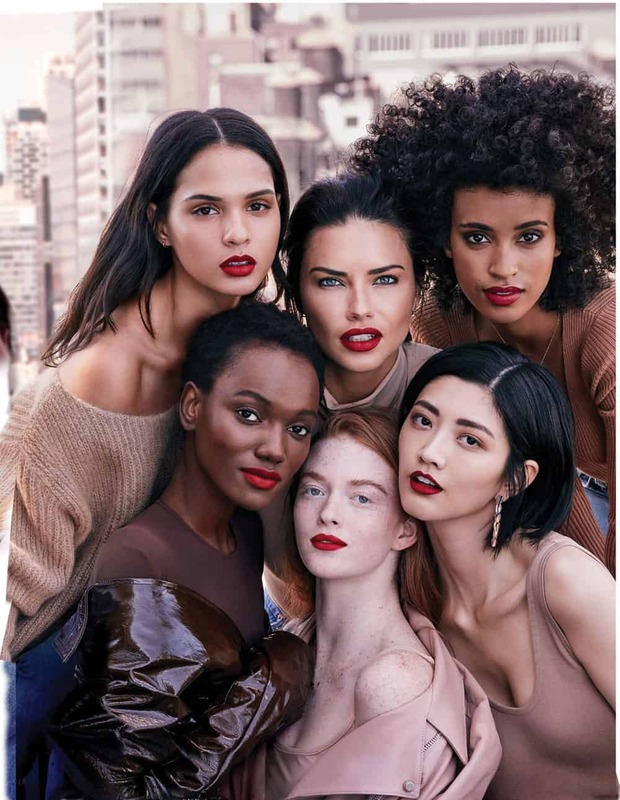 Maybelline has been working with me since I was 19, and we became like a family. I saw the brand grow, and the commercials are a much bigger production now. They have the best makeup, hair, and stylists in the industry. It’s been a pleasure. You’re the face of the Puma x Maybelline New York collaboration. Did you have anything to do with that pairing? I’m not sure how it came together, but I’m a Puma ambassador and the brilliant idea came to create a makeup line for women who are active and on the go and don’t have time to be redoing their makeup. They created this line, which is sweatproof. It stays on. It’s incredible! I have a lot of friends who are athletes and they want to wear makeup. They haven’t been able to in the past because it would come off, and so they’re excited about it. Who do you credit with helping to launch your modeling career? My mom. Some of her friends told her I should become a model. She introduced me to an agency in my hometown, and that’s how everything started. What does she think of your success today? She’s very proud. I don’t think we knew that I would achieve so much. I never thought my name would be known globally. My whole family is proud. They’ve supported me all the way. We’re honoring you as Fashion Icon. Do you remember the first thing you’ve ever won? At school, there was a competition for a scholarship, and you had to paint. I painted a little girl sitting on the moon. I used to draw a lot before. I got that talent from my father, who is an artist. I won! How much longer do you want to model? I want to continue modeling! I’m 37 and I want to show the world that a powerful woman can be beautiful as a mature woman and as a mom. I use fashion as a tool to inspire women to take care of themselves. Age is not important. It’s all about how you carry yourself.